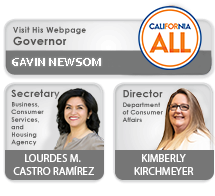 You may use the License Lookup feature on this website to search for and determine whether a person or firm is currently authorized to practice public accounting in California. Searches for a specific name can only be performed under the present name. All information available through this search is public information. If a "yes" appears in Disciplinary Actions / License Restrictions, please click on "Details" for further information. This will take you to the CBA's Public Enforcement Documents which can also be accessed directly from the homepage. Summaries, accusations and final decision orders for all decisions occurring since July 1, 1993 for licenses revoked or surrendered, and those licensees with license restrictions. Summaries, accusations and final decision orders for all decisions taking effect on or after January 1, 2005 that resulted in a license being placed on probation. Prior to this date, for licenses that were placed on probation, the summaries, accusation and final decision orders were removed after seven years from the decision effective date. For details regarding these prior disciplinary actions, please contact the CBA Enforcement Division at the contact information below. Currently effective Interim Suspension Orders (ISO) or Temporary Restraining Orders (TRO). They also contain various terms which may require some explanation. A list of Enforcement Definitions can be found below. A formal document that charges violations(s) of the laws under CBA's jurisdiction including, the California Accountancy Act and/or CBA regulations by a licensee. The charges in the accusation are allegations. Allegations are not a final determination of wrongdoing and are subject to adjudication and final review by the CBA pursuant to the Administrative Procedure Act. The licensee is ordered to pay the CBA certain costs of investigation and prosecution including, but not limited to, attorney fees. The licensee failed to file a Notice of Defense or has otherwise failed to request a hearing, object, or otherwise contest the accusation. The CBA takes action without a hearing based on the accusation and documentary evidence on file. The licensee may continue to engage in activities for which licensure is required, under specific terms and conditions. A revoked license that is restored, not sooner than one year from the date of revocation, to a clear or inactive status after petition to and approval by the CBA. Reinstatement may include probation and/or terms and conditions. The individual, partnership, or corporation no longer is licensed as a result of a disciplinary action. The action does not immediately take place and may not take place if the licensee complies with other conditions (such as a probation term). The matter is negotiated and settled without going to hearing. The licensee has surrendered the license. The individual, partnership, or corporation no longer is licensed. The CBA, however, may impose discipline against a surrendered license in certain circumstances. Surrender may also require certain conditions be met should the former licensee ever choose to reapply for licensure. The license is prohibited for a specific period of time from engaging in activities for which licensure is required. A license is canceled if not renewed within five years following its expiration date. A licensee with a canceled license may reapply as a new applicant and meet the current requirements for approval. Upon approval, a new CPA license number is issued. The CBA's records indicate that the license is current and valid. The licensee can engage in the practice of public accountancy prior to the license expiration date. A licensee must complete required CE in order to maintain a current and valid license. The license is current and valid. The licensee can engage in the practice of public accountancy prior to the license expiration date. Additionally, the licensee has been disciplined and may have part of the disciplinary order (for example, revocation or suspension) stayed and may continue to practice under specific terms and conditions. Please contact the CBA for further information. The license is current and valid. The licensee can engage in the practice of public accountancy prior to the license expiration date. Additionally, the licensee has permanent license restriction(s) as part of a disciplinary order (for example, permanently prohibited from performing audits or reviews). Please contact the CBA for further information. The license was not renewed by its expiration date and is expired. The individual does not have authority to practice public accountancy. The license was not renewed by its expiration date and is expired. The individual does not have authority to practice public accountancy. Additionally, the licensee has been disciplined and may have part of the disciplinary order (for example, revocation or suspension) stayed with specific terms and conditions. Please contact the CBA for further information. The license is denied and no longer valid pursuant to Section 17520 of the Family Code. Any questions should be directed to the Family Support Unit at (916) 323-0884. An inactive license is current; however, the licensee is not required to meet the continuing education requirements and is not permitted to engage in the practice of public accountancy. An inactive license is current; however, the licensee is not required to meet the continuing education requirements and is not permitted to engage in the practice of public accountancy. Additionally, the licensee has been disciplined and may have part of the disciplinary order (for example, revocation or suspension) stayed with specific terms and conditions. Please contact the CBA for further information. The license is current. The licensee may not engage in the practice of public accountancy and may not provide public accounting services in private practice (public accounting services to the general public). If, however, the licensee is required by the military to provide public accounting services while on active duty, the license shall be considered to be in military active status. A renewal application has been submitted and is being processed. Please contact the CBA for further information. The licensee is retired and may not engage in the practice of public accountancy. The individual, partnership, or corporation is no longer licensed as a result of a disciplinary action. The licensee has surrendered the license. The individual, partnership, or corporation is no longer licensed. The CBA, however, may impose discipline against a surrendered license in certain circumstances. Surrender also may require certain conditions be met should the former licensee ever choose to reapply for licensure. The licensee is prohibited from engaging for a specific period of time in the activities for which licensure is required. The licensee has been disciplined and may have part of the disciplinary order (for example, revocation or suspension) stayed with specific terms and conditions. Please contact the CBA for further information. The Experience Completed field reflects the type of experience the individual completed in order to obtain his/her CPA license. This field may show A, G, or be blank. All CPAs must complete a minimum amount of experience providing any type of service or advice involving the use of accounting, attest, compilation, management advisory, financial advisory, tax, or consulting skills. The experience may have been gained through employment in public accounting, private industry, or government. This CPA also completed at least 500 hours of experience in attest services, the minimum amount of experience required to sign reports on attest engagements. This experience may have been completed before or after receiving his/her CPA license. This CPA may sign reports on attest engagements. This CPA can perform a wide range of accounting services, including participating in attest engagements; however, the CPA may not sign reports on attest engagements. The Experience Completed field is left blank for firm licenses, as the designation applies only to individual licenses. If the services you require include an audit, a review of financial statements, or an examination of prospective financial information, you need to be sure that the CPA signing the report is authorized and qualified to do so. It is important to understand that there is a distinction between a CPA who is authorized by law to sign reports on attest engagements and a CPA who is qualified (due to knowledge and experience) to perform the work that he or she is being hired to perform; this includes signing reports on attest engagements. Authorized means the CBA has determined that the CPA completed a minimum of 500 hours of experience in attest work. The 500-hour minimum standard ensures entry-level exposure to attest engagements. Qualified means that in addition to meeting the 500-hour minimum standard to be authorized to sign reports on attest engagements, the CPA complies with applicable professional standards, which requires the CPA to undertake only those professional services that can reasonably be completed with professional competence, including achieving a level of competence that will assure that the quality of service meets the high level of professionalism required. It is the responsibility of the CPA to evaluate whether his or her specific education, experience, and judgment are adequate to perform the services being requested. As a result, it important to ask the CPA about his or her number of years of experience, continuing education, and recent peer review, if any. The reports contained as part of this website represent summaries of those formal disciplinary orders issued by the Department of Consumer Affairs (Department) and its participating programs, boards, committees, and commissions, imposing suspension, revocation or other discipline. Enforcement proceedings that are resolved by dismissal of the accusation or otherwise result in no actual discipline of a license are not reported at this website. Summary information on recent orders is prepared approximately thirty (30) days after the final decision date of an enforcement case. Therefore, although this website may presently lack any such report, some licensees will actually be named in accusations, or be subject to disciplinary orders. The lack of summary for a particular licensed person does not mean that the licensee has never been the subject of an accusation or administrative discipline. The brief summaries offered at this website are not intended as substitutes for the actual decisions and orders issued by the Department and its participating programs, boards, committees and commissions. Copies of those decisions and orders are available at no cost by writing to the designated address for each program or board. Also, the actions reported here may not be final and may not reflect any judicial action to stay or modify the administrative order. You should not take any action based on information contained in these summaries without verifying the information and determining whether the administrative order has been stayed or modified by a court. As used in this summary, the term "accusation" is a formal document which notifies a licensee of the agency's charges against the licensee, and that requests a disciplinary order. The licensee is entitled to contest the charges in a formal hearing before an administrative law judge. An accusation is usually resolved by an agency decision following such a hearing or by an agency decision pursuant to a settlement agreement. Often there is a considerable period of time between the date of filing an accusation and the resolution of the accusation. The term "suspended" means that the licensee is prohibited for a period of time from engaging in activities for which licensure is required, usually for a specified number of days or months. A suspension will usually be imposed in conjunction with a lengthy period of probation of one or more years. The term "revoked" means that the individual, partnership, or corporation is no longer licensed as a result of an enforcement action. Revocation is not necessarily permanent. The revoked licensee has the right, one year or more after the revocation, to petition the California Board of Accountancy for reinstatement. Reinstatement of the revoked license must be approved by the CBA and may include probation and/or terms and conditions.